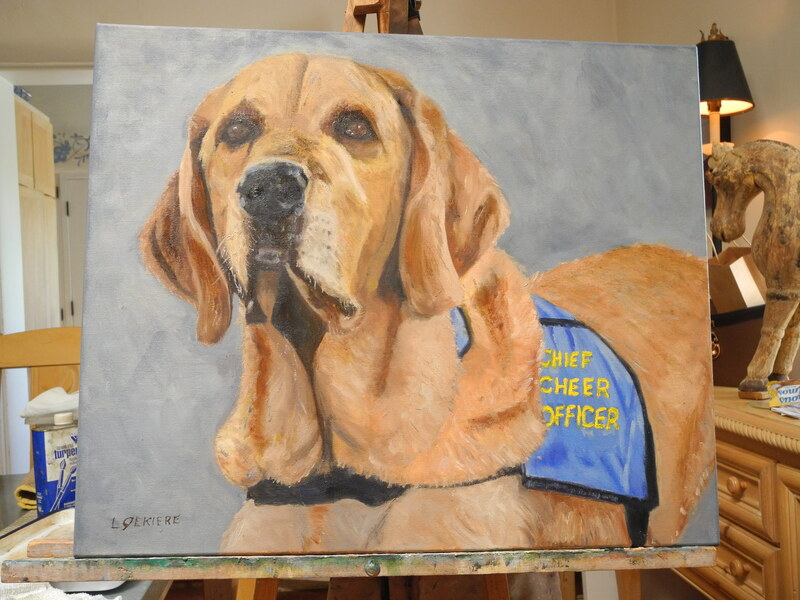 As promised, I wanted to share the finished painting of Shiloh, the first prize winner in my “More than a Pet, More than a Friend…Family” photo contest. Shiloh’s photo was submitted by Jill C. CEO of the Ronald McDonald House of Dallas. This is the finished portrait of Shiloh. As you can see, there is quite a difference between this painting and the full color palette step in my original post. I was quite pleased with the final product and, as you can see below, so were Shiloh and Jill. Delivering Shiloh’s finished painting to Jill at the Ronald McDonald House was a delight. 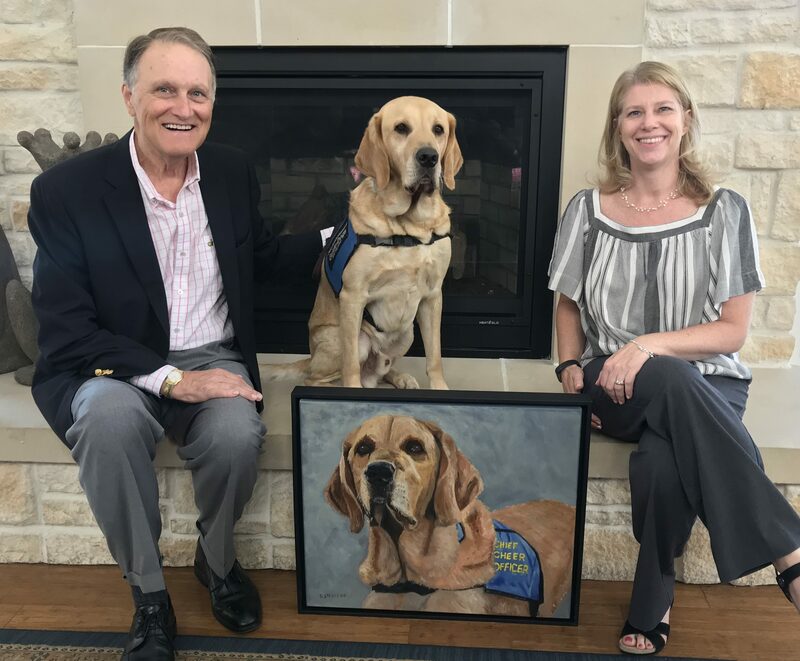 Both Jill and Shiloh were very happy with his portrait and Shiloh was quite pleased to pose with it! I want to thank Jill for entering the contest and thank the Ronald McDonald House and Shiloh for all the work they do in the community! I hope you enjoyed seeing the progression of Shiloh’s painting. If you would like a chance to win a contest like Jill and Shiloh did, be sure to sign up for my newsletter. Just click here or click on the graphic below! 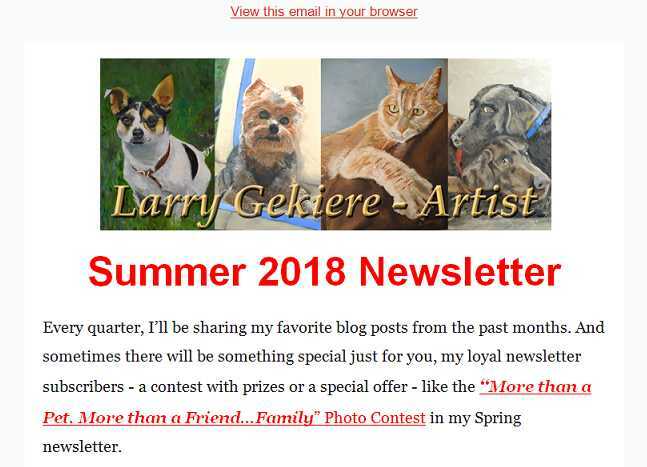 Once you sign up, you will receive my next newsletter. Also, if you are on Facebook, be sure to LIKE my Facebook page for more announcements about the contests and other fun things! If you would like your own custom painting – a portrait of a beloved pet or of a loved one – just complete this form. If you have any questions, just contact me via email or call me at (214) 405-1834. It is fabulous! We treasure ours, as well. Thank you for sharing your talent with the world!!! We will be sharing your Luna Rose’s story and her painting with our newsletter subscribers soon, Lezli, and posting it later here. Thank YOU for your generous comment and for entering the contest! Luna Rose is a very special girl! What an amazing gift you have! and what a surprise! You never cease to amaze Mr Gekiere! Thank you so much, Mia!! I appreciate your generous comment!